I can't find a heatmap in the reporting. Anyone know how to access a mailing's heatmap? I can't find a heatmap in the reporting area. Anyone know how to access a link to the heatmap for a mailing? Re: I can't find a heatmap in the reporting. Anyone know how to access a mailing's heatmap? Thanks for coming to the Community with your questions! To find the heatmap, you can select on the title of the email you are looking to get the reporting for. Once you select the title of the sent email, you will see in the upper right hand corner a button that says "Click Reporting". This button will bring you to the heatmap of your email. It will display a hot pink circle on the top 5 links that have been clicked in your email. Take a look at the screenshot below to better direct you! Derpa derp! There it was, right under my nose. You're very welcome! Please let us know if we can assist with anything else! Does the Click report function still exist? I don't have the "Click Report" option in my sent email report - any advice on where I can find the heat map? I'm so sorry you're unable to see the click report of this email! I was able to locate this campaign in your account and could replicate the same experience. 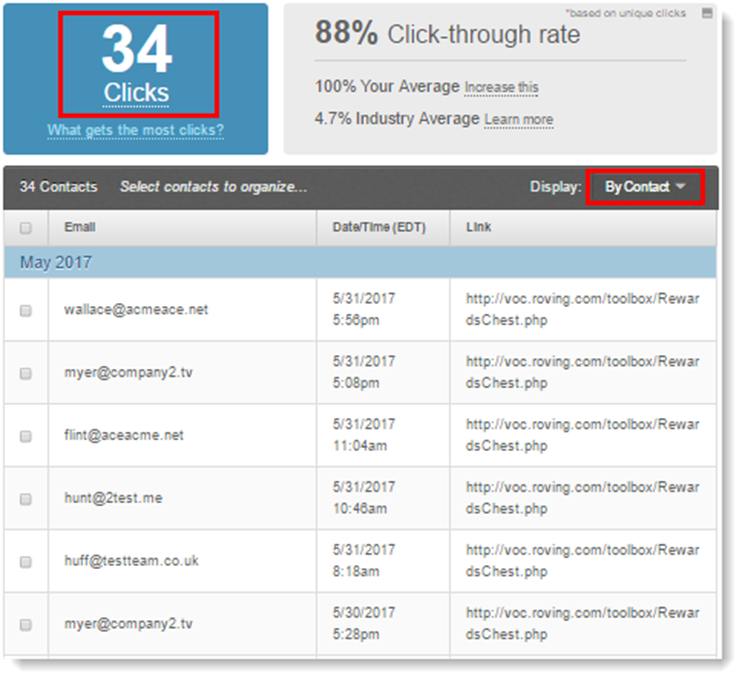 At this time email campaigns using our Resend to Non-Openers feature will not show the Click Activity on its reporting page. This is however a feature request I have tracked in your account and submitted to the appropriate teams. In the meantime as a work around, I would suggest going to Reporting tab in your account to view this campaign's click report. I apologize for any inconvenience this may cause! Re: Re: I can't find a heatmap in the reporting. Anyone know how to access a mailing's heatmap? Click Reporting, then click the hyper-linked number of clicks in the Click Through Rate column for the campaign you want to review. By URL - This is the default view. It sorts results by the link's URL and shows the number of unique clicks each link received. By Contact - Sorts by contact and shows what link the contact clicked. Finding out which links were visited repeatedly, and which contacts clicked multiple times, might give you additional insight. If you want to improve your click-through rate, there are ways to optimize your links to make them more enticing. Learn more about your Clicks here or reach back out with any additional questions you have!